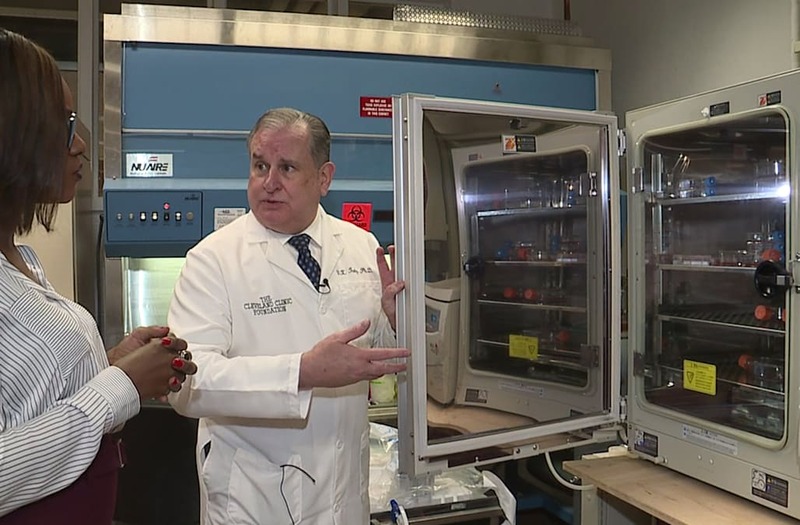 CLEVELAND (WJW) -- Meet the mastermind behind a medical game-changer that could ultimately eradicate breast cancer, not only here in the U.S., but the world. Inside a quiet lab in Cleveland Clinic’s Department of Immunology, Vincent Tuohy, Ph.D. has been hard at work since 2002, researching and creating a breast cancer vaccine. It will soon be in phase one of clinical trials to determine proper dosage and safety. "It targets a protein that's found in most or vast majority of what are called triple-negative breast cancer. Triple-negative is the most lethal form of breast cancer," Dr. Tuohy said. The 56-year-old was most recently diagnosed with breast cancer soon after the 2017 Emmy Awards. She confirmed the diagnosis on Instagram, quickly calling attention to the plight of other women who don't have health care. "1 in 8 women get breast cancer. Today, I'm the one. The good news is that I have the most glorious group of supportive and caring family and friends, and fantastic insurance through my union. The bad news is that not all women are so lucky, so let's fight all cancers and make universal health care a reality," she wrote in the post. In 2013, at age 37, the actress wrote a New York Times piece about her experiences with breast cancer and the BRCA1 gene. She had an 87% risk of breast cancer, 50% risk of ovarian cancer, so she took preventative action, including a double mastectomy and the later removal of her ovaries and fallopian tubes. "Once I knew that this was my reality, I decided to be proactive and to minimize the risk as much I could. I made a decision to have a preventive double mastectomy. I started with the breasts, as my risk of breast cancer is higher than my risk of ovarian cancer, and the surgery is more complex," she wrote. Continuing in the New York Times, But I am writing about it now because I hope that other women can benefit from my experience. Cancer is still a word that strikes fear into people’s hearts, producing a deep sense of powerlessness. But today it is possible to find out through a blood test whether you are highly susceptible to breast and ovarian cancer, and then take action. At 40, the acclaimed actress was diagnosed with breast cancer after a routine mammogram in 2006. She decided to keep it private for a year after her diagnosis. At age 12, Nixon watched her mother battle breast cancer and knew the importance of preventative care. "I’ve learned that if you catch breast cancer early, the chances are overwhelmingly good that you’ll be cured. So my attitude, which very much mirrored my mother’s, was this wasn’t a big deal," the star said, according to Marie Claire. In 2011, after the diagnosis of an early-stage tumor, the host underwent a double mastectomy and reconstructive surgery. She said to Glamour: "....My doctor said, "We have great news in one breast and bad news in the other. You need to start thinking about a mastectomy." That had been the furthest thing from my mind. I knew nothing about breast cancer before this happened to me, and I thought mastectomy meant stage three or four cancer. I didn't have a big family history of it. I just never thought it would happen to me. I really didn't." The former "Beverly Hills, 90210" star was diagnosed in 2015 and regularly documented her battle on social media. After going through chemotherapy, she announced she's in remission in April 2017. "Moments. They happen. Today was and is a moment. What does remission mean? I heard that word and have no idea how to react. Good news? YES. Overwhelming. YES. Now more waiting. As every single one of my fellow cancer family knows, the next five years is crucial. Reoccurrences happen all the time," she shared on social media. In 2006, the singer publicly announced she was battling the disease after she underwent "minimally invasive surgery." "I am inspired by the brave women who have faced this battle before me and grateful for the support of family and friends," she said according to ABC News. In 2017, the 68-year-old singer and actress revealed she was once again battling breast cancer. After her first diagnosis in 1992, she underwent a partial mastectomy as well as chemo. "I am really grateful for and touched by the worldwide outpouring of love and concern. Thank you. I am feeling good and enjoying total support from my family and friends, along with a team of wellness and medical practitioners both here in the US and at my Olivia Newton-John Cancer Wellness and Research Centre in Melbourne, Australia. I’m totally confident that my new journey will have a positive success story to inspire others!” she said exclusively to People in June. Because of the singer's family history, Etheridge was "vigilant" about examinations before eventually being diagnosed in 2004. "I am the healthiest I have ever been in my life. It excites me every day when I can wake up and feel energy and feel good and feel purpose. The changes I made were big and not easy. Sugar is a drug, incredibly addictive. That one change can make a huge difference in your life," she said to ABC News in 2015. At 36 years old, the actress was diagnosed with breast cancer in 2008. After biopsies and a lumpectomy, as well as radiation, she tested positive for the BRCA gene. Later, she underwent a double mastectomy. "It came on really fast. It was one of those things that I woke up and it felt so right," she says. "It just seemed like, 'I don't want to have to deal with this again. I don't want to keep putting that stuff in my body. I just want to be done with this.' & I was just going to let them go," she said according to CNN. In 2015, it became known that the actress was battling breast cancer and underwent both a double mastectomy and reconstructive surgery. Since then, she's been outspoken about encouraging others to be vigilant about routine checks. "Last week, with my husband by my side, and with the love and support of family and friends, I underwent a bilateral mastectomy and reconstruction for breast cancer after a diagnosis of invasive lobular carcinoma. I am recovering and most importantly, expected to make a full recovery. Why? Because I caught this early, have excellent doctors and because I got a second opinion," she said according to People. Tuohy said it is also the form of breast cancer that women get if they have a genetic mutation in their BRCA-1 genes, which has many women opting to be proactive, undergoing a double mastectomy. "We do about 50 voluntary mastectomies here a year at the Cleveland Clinic and it's a horrible thing for women to go through. It’s a life-changing event for them. I think a vaccine would be a much more civilized way for controlling their problem,” Tuohy said. He said up until this point, it had been an uphill battle financially and convincing his colleagues that the vaccine would actually work. While the medical community had been slow in embracing Dr. Tuohy's vision, he has cultivated a strong following of supporters here in Cleveland, raising awareness, and most importantly, research dollars. Marjorie Moyar and Susan Larson are co-chairs of Women Who Care About Breast Cancer, a group formed to raise funds for Dr. Tuohy’s research. In five years, the group has raised more than $150,000. "We all have friends, acquaintances, family members who have been touched by breast cancer," Moyer said. More good news: Tuohy just received a $6 million grant from the Department of Defense towards his mission. "We need defense, and the best defense for these cancers, I think, is a vaccine that prevents it." Once clinical trials begin, it could take up to 10 years before the breast cancer vaccine would be made available to the masses. But despite the long journey, it will hopefully lead to a well-developed adult vaccination program for generations to come.